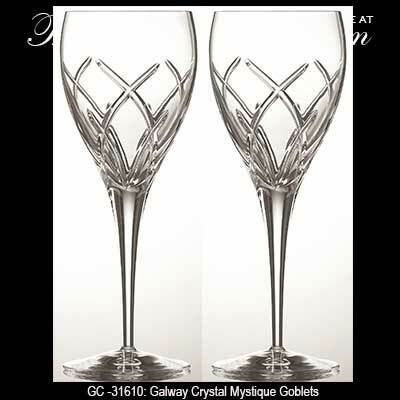 These Irish crystal goblets from Galway Crystal are cut in the mystique pattern. Galway Crystal presents a beautiful pair of 24% leaded crystal goblets that are cut in the mystique pattern. These Irish goblets measure 9 1/4" tall and are typically used for water, but may also be used for wine. The Irish crystal goblets are gift boxed and are from Galway, Ireland.